Memorials may be directed to Immaculate Conception Catholic Church or St. Croix Hospice. In lieu of flowers, please pass along kindness to someone. To send flowers or a remembrance gift to the family of Calvin Larson, please visit our Tribute Store. 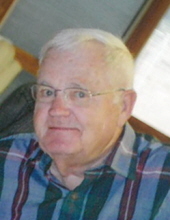 Scripture Service beginning at 7:00 p.m.
"Email Address" would like to share the life celebration of Calvin Larson. Click on the "link" to go to share a favorite memory or leave a condolence message for the family.